Spinal deformity is an abnormal curvature of the spine which can occur due to numerous conditions including degeneration, fractures, and changes following surgery, injury, infection, malignancy, and defect. Spinal deformity does not equate to pain unless there is compression or irritation of the nerve roots or other spinal structures such as facet joints. One potential cause of a pinched nerve experienced as neck pain is Cervical Stenosis. Cervical stenosis can also contribute to intermittent shooting pain in your shoulders, arms, and legs. This may cause difficulty walking or a heavy feeling in your legs, a decrease in your fine motor skills due to weakness in strength, or a referred arm pain. In lumbar stenosis, the spinal nerves of your lower back are compressed resulting in low back pain, tingling, weakness, or numbness that can travel to into your buttock or legs (Sciatica). This discomfort caused by stenosis is more likely to occur with activity and relieved by rest. It is estimated that about 400,000 American suffer from pain caused by lumbar spinal stenosis. Diagnosis of spinal stenosis begins with a one-on-one discussion with a Spine Doctor where you will discuss your symptoms of back and/or neck pain and associated signs. Next, the Doctor may order radiographs such as x-rays, MRIs, and CTs to help locate the pain. Here at the Orthopaedic & Spine Center of New Jersey, you along with our physician and staff will develop a conservative plan of care to help alleviate your neck or back pain caused by spinal stenosis. If none- surgical interventions do not meet your pain goals, surgical interventions may be discussed, such as decompression (removing pressure off of nerves). Please call our office for more information regarding both non-surgical and surgical interventions available to help relieve your pain caused by Spinal Stenosis. Have a look at our Facebook page to read about Dancing with the Stars judge Carrie Ann’s experience with spinal stenosis and her successful battle to overcome the pain. Spondylosis is a stiffening or fixation of the spinal vertebrae as the result of a process of disease, which can lead to fusion and immobilization of the vertebral bones. Spondylosis also refers to degenerative changes in the spine such as bone spurs and degeneration of intervertebral discs. 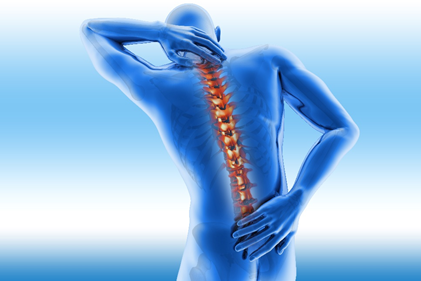 Spondylosis changes in the spine are frequently referred to as osteoarthritis. A common result of aging, symptoms can occur between the ages of 20 and 50, and by age 40, the majority of adults have some evidence of spondylosis on X-ray studies. It can also result from genetic predisposition, extreme sports or injuries. While spondylosis can be symptom-free, it can cause back or neck pain, stiffness that worsens over time due to compression, bulging discs, bone spurs, pain in the shoulders and arms, or sciatica.